Some time ago, you suggested an ICL7663 adjustable voltage regulator for a battery operated application. And it worked great. Now I have another application that has the same requirements — except for size. I’m limited to a very small case. I’m using a PIC16F628 and a nine-volt transistor battery. Is there a low-power voltage regulator that does not require all of the resistors and caps of the ICL7663 design? Maybe an LDO volt regulator is what I’m hoping for. Any suggestions? The LDO (low-dropout) voltage regulator is probably the most misunderstood of all voltage regulators. Many users think that because the voltage between the input and the output is 200 mV or less, it will save power. Not true. Let’s use your nine-volt battery as an example. The 16F628 normally works at five volts and draws about 2 mA. That means that somehow or another you have to shed four volts. All linear voltage regulators — including LDOs — do that by inserting a series resistance between the battery and your PIC. Simple math (P = EI) tells us that 8 mW has to be wasted across the regulator as heat — even across an LDO regulator. Since the PIC dissipates 10 mW on its own, the wasted power amounts to almost half the power your battery has to give. But that’s only half the story. Let’s take the 78L05, for example. Not only must it dissipate your four volts, but it consumes 3 mA even when it’s not doing anything but sitting there. Math says that with a nine-volt battery, that’s another 27 mW of wasted power. This is why the LDO was invented. To reduce this wasted battery power. The proper way to use an LDO is to match the input voltage to the output voltage. The less voltage the regulator has to waste, the more efficient your design and the longer the battery will last. For example, if you replace the nine-volt battery with four AA cells or two lithium cells — which equal six volts — the voltage drop becomes one volt. One volt at 2 mA is just 2 mW, a four-fold gain. Another benefit of LDO voltage regulators is their low standby current — which can be as low as 10 µA. The LP2980 requires just 100 µA at 2 mA. Adding up the numbers, it comes to 2.1 mW of operating power — a far cry from the 35 mW demanded by a 78L05. I’ve designed and built lots of 16F628 circuits, and found the LD2980 (from STMicroelectronics) to be most useful. It has a low 100 µA quiescent current, 120 mV voltage drop, and a small SOT-89 footprint. It also comes in many different fixed-voltages, making it easier to match the voltage drop to the battery size (the 16F628 has a Vcc range of 3.0 to 5.5 volts; 2.0 to 5.5 volts for the 16LF628) for best efficiency. 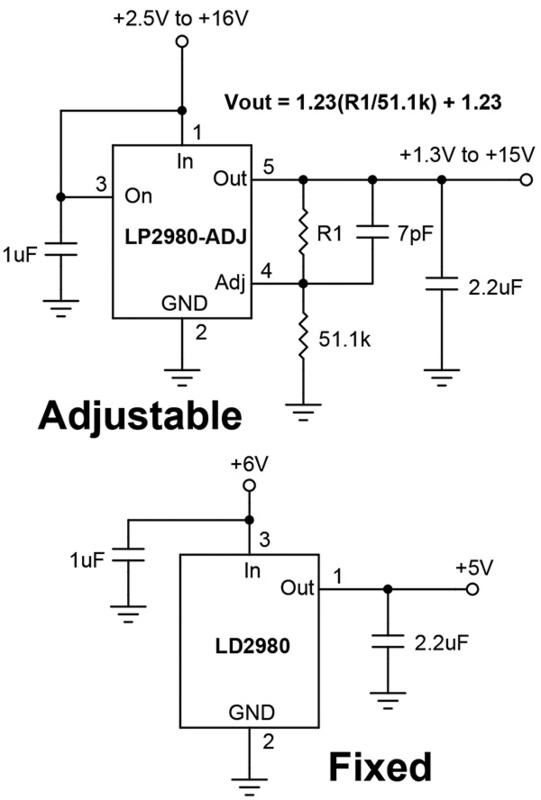 When I needed an adjustable voltage source, I used the LP2980-ADJ. The figure shows both designs.